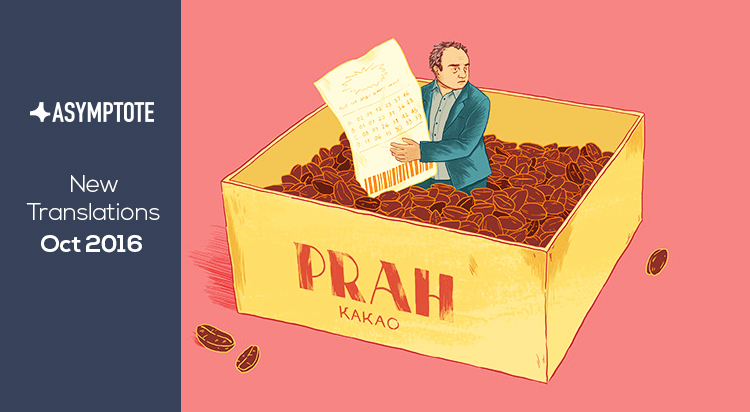 Asymptote reviews some of the best new books translated from the Arabic, Korean, and Spanish. 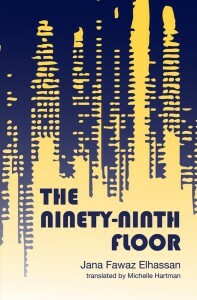 The Ninety-Ninth Floor, by Fawaz Elhassan, tr. Michelle Hartman. Interlink Publishing. Shortlisted last year for the International Prize for Arabic Fiction, The Ninety-Ninth Floor is Jana Fawaz Elhassan’s third book: an ambitious, multi-voiced novel, spanning the topographies of the Sabra and Shatila refugee camps in 1980s Beirut, and New York in the New Millennium. It is also the first of Elhassan’s works to be translated, by Michelle Hartman, from the Arabic into English. The plot centers around Maj’d, a successful video-game designer whose life among the dizzying skyscrapers of Manhattan, and the subterranean depths of its subway system, bears a haunting resemblance to the cramped, vertical heights of the refugee camps he has fled where “garbage piled up in alleyways”. Palestine, reflects Maj’d, is “a land that inhabits me that I have never stepped foot on”. It occupies his deepest memories, the walls of the camp where the displaced mark the distance from imagined homelands, and is framed—in the present-day narrative—as a map in Maj’d’s apartment in New York. It is an imagined space where Maj’d’s father obstinately believes his dead wife and Maj’d’s mother is waiting for them with their unborn child. The spatial dimensions of the novel mirror this hyper-reality. The text is littered with a cast of characters who are attempting to navigate life in the wake of war and political trauma. Consequently, the plot is distended by a lack of closure, permeated with repetitive strains of absence and loss. Maj’d’s relationship with Hilda, a dancer who is also trying to build her life anew, away from her Orthodox Christian family in Lebanon, becomes a battle-space for negotiating distances and originary points from which to examine notions of identity, belonging, and worth. Is the love they share true and authentic, or is there a more complex conflation of the female body and nationhood at play here? There are certainly echoes of recent political fiction from the Middle East in The Ninety-Ninth Floor, such as of the spare, Kafkaesque political allegory The Silence and the Roar by Syrian writer Nihad Sirees. Yet, Elhassan is less interested in form, and more invested in dissecting the emotional vicissitudes of love. There is a certain sagginess to the novel which gestures to the so-called ninety-nine floors or levels of the book. When Hilda returns to Lebanon, to the home she has left behind, she thinks back to the home she has created with Maj’d. “Perhaps,” she considers, “I also came back to occupy this memory, to tell it that we can arrive at some kind of settlement: to expand into all places and be done with our enmity toward our roots”. It is hard not to read these words without a degree of skepticism, to wonder whether this resolution papers over the allegorical implications of difference and attachment. But perhaps it is more fitting to hear these closing lines echo like the one-note sonic beeps of an Atari or PlayStation video game, like the kind designed by Maj’d. In this simulated fantasy, Elhassan suggests, love is creative and imaginative work in a world where our collective national consciousness consigns us to love and live in very specific ways. A Greater Music, by Bae Suah, tr. Deborah Smith. Open Letter Books. 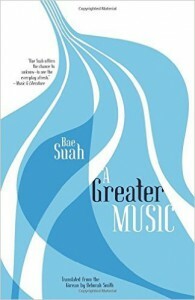 It is perhaps inevitable that Deborah Smith’s new translation of Bae Suah’s novel A Greater Music—forthcoming this October from Open Letter Books—will be compared to her recent prizewinning translations of Han Kang’s The Vegetarian and Human Acts, both of which are suffused with Han’s unique voice and vision. But Bae is a compelling, inventive, and significant author in her own right, and Smith’s ability to match these qualities with a stylish and highly readable translation leaves no doubt about her contribution to the growing canon of Korean literature available in English. A Greater Music, which records the experiences of a young Korean narrator’s relocation to Berlin through her relationships with Joachim, her boyfriend, and M, her first German language teacher, draws at least in part from its author’s own journey. Bae Suah, a former civil servant with a degree in Chemistry who made her literary debut in 1988, lived in Germany for 11 months in 2001, learning the language there. Though she has since moved back to Seoul, she has also previously translated various works by Sebald and Kafka into Korean.